Ignoring this strategic imperative to improve the user experience will result in several problems, the most apparent being higher costs. Research indicates that the annual cost of complexity, in terms of lost productivity, is $800 per person. This cost is substantial, but complexity also increases other costs associated with turnover and employee attrition because frustration with systems or onerous security demands causes employees to leave for other jobs. This is common when employees believe that internal systems make it difficult for them to succeed in their work. Making matters worse, this frustration leads to individual business units bringing in new cloud-based services that they believe are a better fit than an internal system that has a poor user experience. These services may compete with internal systems, resulting in more wasted money because the organization pays twice for the same functionality. This white paper explores a simple but powerful idea: When the business begins to think from the employee’s point of view — putting the user at the center of IT — technology becomes an enabler of each individual’s full potential. 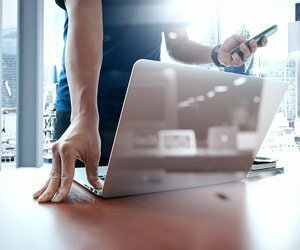 Having user-centric digital workspaces prevents business units from adopting shadow IT, a practice that can create challenges. Without digital workspaces, business leaders think external services are the only way to get a quality experience, and the use of those services will explode. This fragments the IT environment, making it difficult to integrate data and develop the analytics and dashboards that are essential to managing a digital business. Further, the organization isn’t able to leverage IT expenditures, resulting in higher costs and fewer internal IT resources to support the business-critical systems that run the company. It is impossible to outlaw services and IT resources that individual business units are dependent upon. There are also likely apps or services provided by outside vendors that IT cannot deliver. For that reason, it is important that the digital workspace platform provides a way to securely integrate these external services with internal ones. This preserves the best user experience but limits complexity and prevents siloed services from creating roadblocks and bottlenecks in the future. A critical but often overlooked aspect of digital transformation is the demand for an excellent user experience and access to the services users deem appropriate, not what a given technology product can provide. In addition, the security stack cannot be disruptive to daily work processes. Empowering users is the optimal design goal for any digital business system. A quality experience will reduce costs and enable organizations to recruit the best talent and support a wide range of solutions without onerous IT complexity. The need for user-centric computing is among the most important capabilities of next-generation digital workspaces. Without it, the entire organization will be in a diminished competitive position.